If you’re fashion-forward and at the forefront of all major trends, take note of tungsten because it’s rising in popularity across the country. Many jewelry fans know that tungsten’s becoming a popular alternative metal for wedding bands, but did you know that tungsten’s breaking into other jewelry products as well? 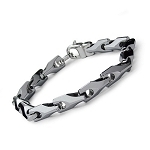 If you’re interested in learning more, check out our fine collection of tungsten bracelets for men. There are numerous benefits to tungsten that have made it a reliable metal for many wristwear enthusiasts. For starters, it’s extremely scratch-resistant and will look like new for a long time to come. This material keeps its finish forever, so there’s no need for expensive maintenance routines with regular use. It also doesn’t bend like traditionally soft or precious metals such as gold. With many traditional metals, you’re stuck with only one color option to choose from. With tungsten, you get to choose between white, black, and classic gray color variations. Tungsten jewelry is also extremely affordable compared to jewelry made with different metals. 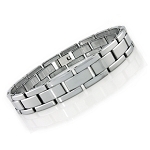 Our selection of men’s tungsten bracelets will continue to surprise you with their durability and attractive appeal. 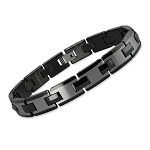 Our tungsten bracelets for men are heavy like gold or platinum but won’t weigh you down or get in your way. If your skin is prone to sensitivities or metal allergies, you’ll be glad to know that tungsten is also hypoallergenic. Our signature collection includes a variety of striking finishes and bracelet design accents that you may have trouble deciding which you like the best! Our bracelets feature three-sided links, gladiator construction, pyramid links, cross links, ID centerpieces, decorative inlays, diamonds, puzzle piece links, and so much more. 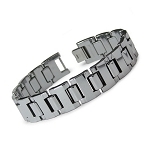 Make the smartest decision you can when it comes to shopping for fashionable wristwear by perusing our vast selection of men’s tungsten bracelets for durable quality you can rely on for years to come. Have questions or need help deciding which bracelet is the best choice for you? Contact us today and we’ll be glad to help you through the process of finding your future tungsten bracelet.